My last run was not what I expected, so I was feeling optimistic that today's run would go better. The odds were in my favor since most bad runs are followed by good ones. But I also had my running group on my side. 1. No planning necessary - regular group meet ups mean I don't have to worry about the when, where, who. I just show up and run! 2. Instant motivation - whether I'm feeling lazy about getting out the door or struggling to keep going during a run, running buddies encourage me to not give up. 3. Free entertainment - some of the funniest things can happen on a group run (right now I'm remembering the time a dog jumped out of a ditch and made all the girls in my group scream as if we just saw an ax murderer instead of a slobbering, friendly pooch). 4. Product sharing - Not only do I get the best recommendations for all kinds of fitgear, but my running friends also let me try-it-out. I can also get honest reviews of things they've already tried. 5. Emergency saves - I admit that sometimes I walk out the door without my hair tie or gloves. When I run with a group someone almost always has an extra. Plus, when I need a mid-run potty stop, someone in the group knows the closest one and whether it's "a good one" (aka clean). This morning it was hot and humid again. We ran nearly the same route today as I did Tuesday, but we slowed way down. That makes all the difference for me on humid runs and it's the thing I struggle with on my own. 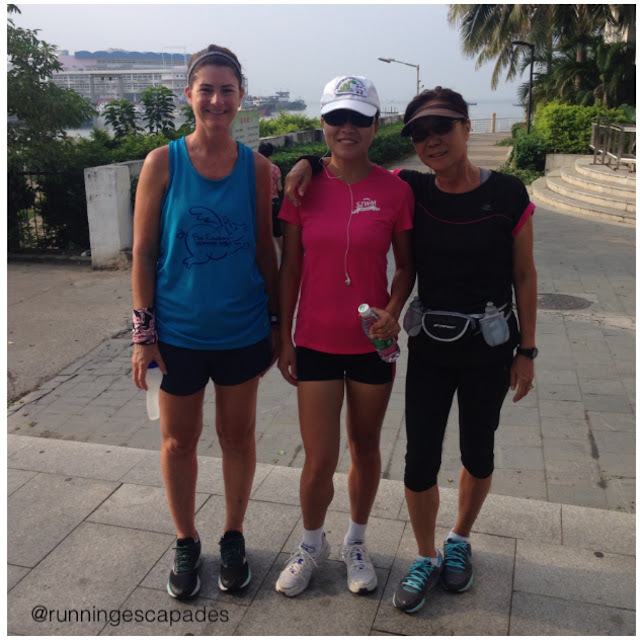 Are you a member of a run group?